You can’t miss this place. Its name is made from red lights. Call Lane Social is one of the newer elements of Call Lane and it’s definitely upping the ante in the “we know how to be cool” stakes. Their website describes them as “effortlessly cool” – if they do say so themselves. 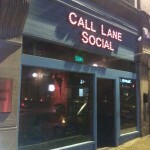 The first thing you notice upon walking into Call Lane Social is very little at all. Wait… that’s your eyes adjusting to the darkness. 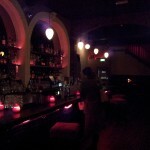 Lighting is provided by some very impressive, but very low, lamps mostly above the bar area. There’s a taxidermied animal wearing a beanie. Of course. 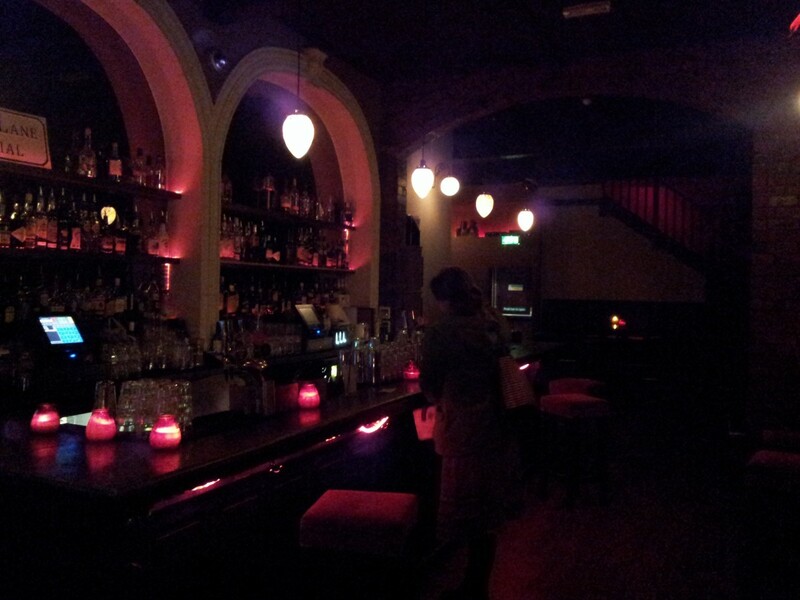 Emily says the atmosphere is very reminiscent of New York bars. There are some decent beers here. They’ve got Ilkley’s MJ Summit (keg) and Kirin Ichiban on tap and Samuel Adams, Quilmes, Pacifico, Cusqueña and Tsingtao amongst their bottled varieties. Of course, you’re paying Call Lane prices for them and you can find all these good beers elsewhere in Leeds for less. This is a maximum exposure on my phone camera. Can you spot Emily in this picture? The music is excellent – they must have played 80% songs I own while we were in there so I may be a bit biased – and, like Mojo they have a screen showing the title of the song that’s currently playing. It’s pretty loud, though – it’s obvious they don’t really want people to have conversations here. It’s a place to get to know people by dancing with them, I suspect. Apparently they also have a secret tiki loft open Thu-Sat, which could be fun. We weren’t there on one of those days so we’ll have to take their word for it. There are no other amenities to speak of – no real dance floor, no comfortable seating, no food. 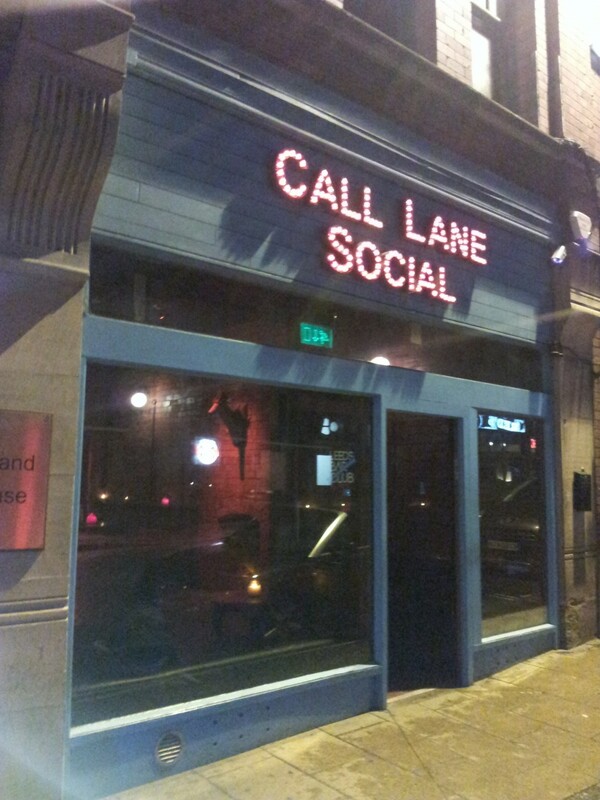 Call Lane Social is, indeed, effortlessly cool. But it’s definitely not our kind of cool.